Edwards students from the MPAcc class of 2017. Hot on the heels of our record-breaking Common Final Examination (CFE) results, Edwards School of Business is excited to announce the Master of Professional Accounting (MPAcc) program has achieved further accreditation by CPA Canada to deliver Capstone 2 module beginning in summer 2018. The MPAcc program at the Edwards School of Business is an innovative graduate degree program that attracts top-notch accounting students from across Canada. 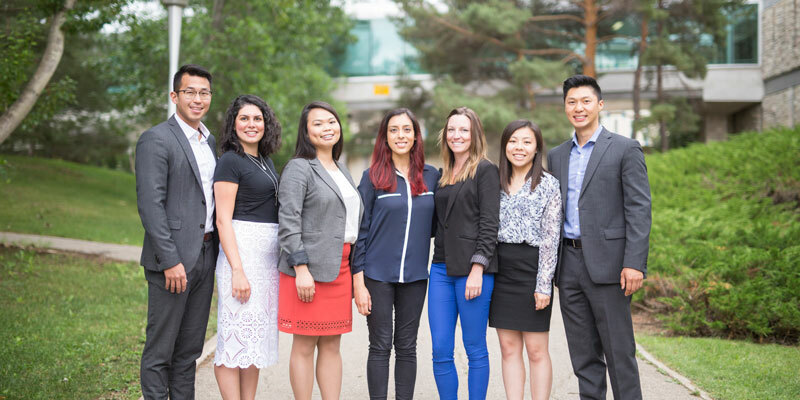 Over the course of two summer terms, students complete a comprehensive program that acts as a proven alternative route for students seeking the CPA designation in Canada in addition to obtaining master’s credentials. The CPA designation is Canada’s pre-eminent accounting and business designation. To obtain the designation, candidates must complete the education requirements, either through the CPA Professional Education Program (PEP) or a CPA accredited master’s program such as Edwards MPAcc. Upon successful completion of their CPA education requirements, candidates must write and pass the challenging three-day CFE, all while completing at least 30 months of qualifying practical work experience. Before summer 2018, Edwards MPAcc students gained advanced standing in CPA Capstone 1 module and then went on to complete Capstone 2 through self-directed learning in the CPA Professional Education Program (PEP) before being eligible to write the CFE. The new accreditation means Edwards MPAcc graduates now gain advanced standing for all CPA PEP modules and thus are eligible to go directly to the CFE. The new Edwards MPAcc Capstone 2 course will integrate content from performance management, finance, tax, assurance, and financial reporting technical areas using cases and simulations and provides the context for the three-day CFE. Students have the opportunity to hone their case writing skills, receive customized feedback and further develop critical thinking and assessment skills; all while in a supportive classroom environment. For more information on admission requirements or how to apply, please visit www.edwardsmpacc.ca.